Are Women To Blame For The Loss Of "Kitchen Economics?" Are you a modern woman, working 40+ hours a week, struggling to pay off your student loans, and living off of convenient, pre-packaged meals? Well guess what? Gill Holcombe is pretty disappointed in you guys. In today's Sunday Times, Holcombe, who has just written a book titled How to Feed Your Family a Healthy, Balanced Diet with Very Little Money . . . and Hardly Any Time, Even if You Have a Tiny Kitchen, Only Three Saucepans and No Fancy Gadgets, laments the loss of "kitchen economics," the art of knowing how to save your money and use your time wisely in order to create quick, well-balanced meals on a budget. "Domestic skills," Holcombe writes, "traditionally a woman’s territory, are no longer valued and, naturally enough, modern women don’t want to be associated with a female stereotype that, rightly or wrongly, is a bit of a joke. The downside is that lots of women now know nothing about home economics or how to produce a handful of nutritious meals out of store-cupboard essentials, even though having this knowledge is not only deeply satisfying, but empowering in a way that wasting large amounts of money in the supermarket can never be." Holcombe criticizes young women and their need to stock up on the fanciest gadgets and gizmos, wasting their money on equipment, when they could just go back to basics and spend the money on quality ingredients instead. In an effort to save time, she argues, we are losing the art of making a real meal, and those who refuse to cook "are just kidding themselves" about their inability to make the time or spend the money on quality home dinners. In some ways, I can see Holcombe's point: anyone who has ever had to buy a gift off of a wedding registry can tell you that her argument that the emphasis is on fancy, stupid equipment rather than the meals themselves is true. Yet Holcombe's major flaw here is this: there is not ONE mention of a man in this article at all. She scolds young women for their choices, and lashes out at how some mothers choose to feed their children: "There is a swath of young women who have time to get a manicure and go out partying, but still genuinely believe they’re too busy to cook. At the other end of the scale, there are women who should know better, but who dish up a nonstop diet of poor-quality ready meals to their children because it seems like the easy option." There is no mention of a father knowing better, or a man spending money on frivolous things instead of a decent roast or some such, no mention of families or couples making these decisions: it is, in Holcombe's mind, the fault of women that "kitchen economics" are fading away, lost to a world of busy families and young hussies who dare to get their nails done instead of buying butternut squash at the Farmer's Market. The notion that we all need to slow down, reconsider our food budgets, and choose healthier, less processed options is nothing new. And yes, many of us do make bad decisions here and there, but believe it or not, Ms. Holcombe, it isn't solely the fault of women that kitchens have changed, nor is it solely the responsiblilty of women, to save what you believe is a dying art. In scolding women for their choices, I'm afraid you're only reiterating that old and tired notion that our place, above all else, is in the kitchen. Do we need to relearn some basic cooking skills and ways to save money and eat well? Yes. But so do our boyfriends, husbands, and male friends. 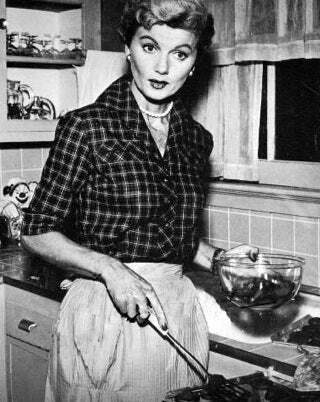 "Savvy grown-up girls know that being clever with food and careful with the household budget means that not only do they get to enjoy the right meals, there could be enough money left over for spending on those manicures — which a 1950s domestic goddess would have definitely approved of," Holcombe writes. Perhaps someone should tell Holcombe that most of us aren't looking for Betty Draper's—or Betty Crocker's—approval.